Navarathri started yesterday. In culinary terms, it means 9 sundals (beans/channa/moong salad basically) for the 9 days of navarathri, Sweets on the first day, friday, saraswathi puja day and Vijayadasami day. Onions, Garlic are not allowed on festive days; Traditional sundals are all about a tadka of mustard, jeera, hing and freshly grated coconut on cooked, salted beans/chana/moong/lentil. My challenge is to come up with variations on the traditional sundal while maintaining the satvic nature of the food. First Day : Sweet Stewed karamani sprouts inspired by Just Bento. I soaked the karamani overnight, then let it sprout in a collander all day. My sis had twins! Delivered at 32 weeks, each baby barely 1.4 kgs now and no bigger than the baby monkey's i see around IIT but mom and babies are doing well and together since yesterday! I am sooooooo thrilled to finally have a baby girl in the family! I found it! 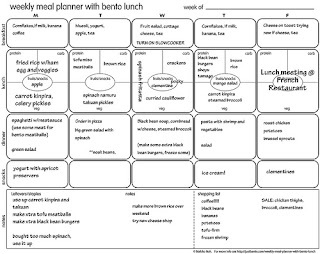 A tool to plan my menu every week! From the justbento page! Each page is split into breakfast, lunch, dinner, snacks and notes for pre-prep. I abhor the idea of printing a page and pasting on the fridge, so I am either going to spend on a whiteboard or simply work with soft copies. I know I don't quite pack my lunch into a bento box, but I think traditional Indian dabbas or their plastic tupperware equivalent my son loves work just as well. I do plan out a protein, carbohydrate and vegetabes and/or fruits for each lunch box. The traditional college tiffen box of pulisaatham or lemon rice does not pass muster in my house. The biggest hurdle for me is the time - my son gets a meagre 25 min for lunch and he plays half that time.